The 9,450-hectare New Clark City is envisioned to be a new metropolis that will rise in the Clark Special Economic Zone, in Capas and Bamban, Tarlac. Cebu, the Philippines, 12 February 2018 – The Bases Conversion and Development Authority (BCDA) and Japan Overseas Infrastructure Investment Corporation for Transport and Urban Development (JOIN) signed a Memorandum of Cooperation with Surbana Jurong of Singapore today in Mactan, Cebu. Singapore Ambassador to the Philippines Kok Li Peng, Special Advisor to the Prime Minister of Japan Hiroto Izumi, and Philippines’ Finance Secretary Carlos Dominguez III and other members of the Cabinet witnessed the signing led by BCDA President and Chief Executive Officer Vivencio Dizon, JOIN President and Chief Executive Officer Takuma Hatano, and Surbana Jurong Group Chief Executive Officer Wong Heang Fine. The collaboration marks the full implementation of New Clark City anchored on the Comprehensive Master Development Plan developed by BCDA and JOIN, in partnership with urban planning and engineering firms AECOM, Nippon Koei and Philkoei International. 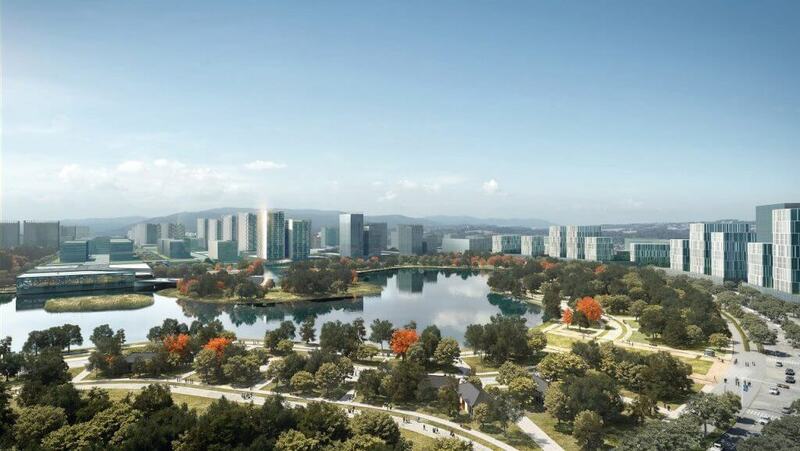 In the agreement, Surbana Jurong will assist BCDA and JOIN in drafting the development management framework, design standard guidelines and environmental guidelines to complement the masterplan of New Clark City. 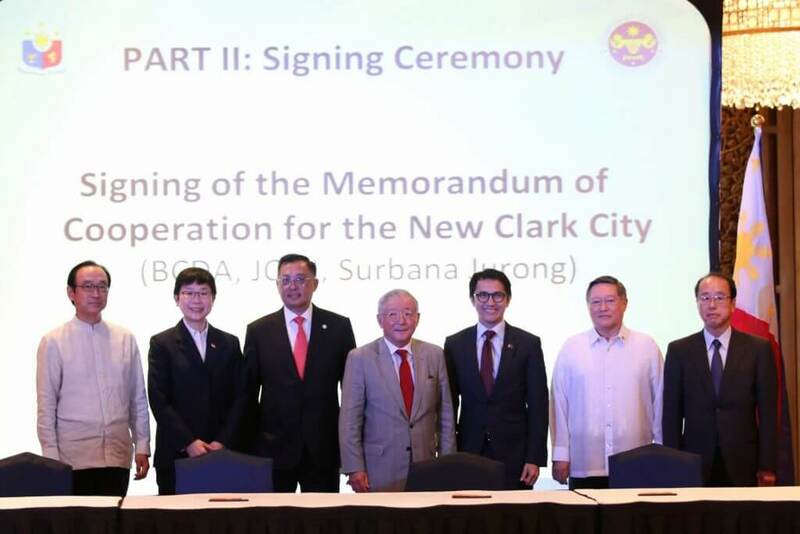 “Surbana Jurong is proud to support BCDA and JOIN in developing New Clark City into the next big metropolis and a showcase to the world of a smart and green city. We will leverage our over 50 years of urban and infrastructure development expertise and our global capabilities to manage the development of the city, and help the Philippine Government bring this vision to reality,” Surbana Jurong’s Group Chief Executive Officer Wong Heang Fine said. Surbana Jurong will also help in utilising Public-Private Partnerships to entice investors to New Clark City. It will also advise in the implementation plan of pioneer developers in New Clark City such as Filinvest Land, Inc.’s mixed-use industrial real estate developments, and MTD Capital Berhad’s National Government Administrative Center. It will also establish the framework of a smart city concept that will have fully integrated infrastructure and utilities for power, water, sewerage, information and communication technology (ICT), security, and traffic management. Surbana Jurong is a wholly owned company of Temasek Holdings Singapore formed through the merger of renowned urban planning and affordable housing leader Surbana International Consultants, and industrialisation corporation Jurong International. It has 50 years of experience in the development of Singapore’s urban, industrial and infrastructure landscape. Meanwhile, JOIN President and CEO Takuma Hatano recognised the significance of the Manila-Clark Railway (PNR North Railway) project in developing New Clark City as one of Japan’s biggest projects in the Philippines. The 106-kilometre alignment will connect Tutuban, Manila to the Clark International Airport and New Clark City. “The railway will immensely benefit commuters as it will cut down travel time from Manila to Clark in an hour, from the current 2-3 hours’ travel time,” Hatano said. He added that the railway is designed to accommodate around 350,000 passengers per day and will provide an efficient and more comfortable travel experience to commuters. The first phase of the project is expected to be completed in 2021. The Manila-Clark Railway is being implemented by the Department of Transportation in partnership with BCDA, and will be funded through Japan’s official development assistance. The feasibility study and the detailed engineering design for the railway will be funded by the Japan International Cooperation Agency (JICA). The 9,450-hectare New Clark City is envisioned to be a new metropolis that will rise in the Clark Special Economic Zone, in Capas and Bamban, Tarlac. It is designed to be the country’s first smart, green, disaster-resilient city, where nature, lifestyle, business, education and industries converge, and will be at par with other modern cities in the world. New Clark City will feature mixed-use real estate developments for housing, a business continuity centre that would also house national government agencies, an agro-industrial park and an international food market. The city will have wide pedestrian lanes, exclusive bicycle lanes, and an integrated mass transit lane. Phase 1 of the project is expected to be completed in 2022. Headquartered in Singapore, the SJ Group has a global workforce of 13,500 employees in more than 120 offices across over 40 countries in Asia, Australia, UK, the Middle East, Africa and the Americas, and an annual turnover of around S$1.5 billion. SJ’s motto ‘Building Cities, Shaping Lives’ reflects its belief that development is more than just steel and concrete. SJ creates spaces and designs infrastructure where people live, work and play, shaping cities into homes with sustainable jobs where communities and businesses can flourish.